Gates provide privacy and protection for those living behind them. When you have a gate installed, you are essentially putting up a very strong barricade between you and anyone who may want to harm you or violate your personal space. Read on and learn about the common problems with gates and how they are repaired. One of the most common materials used to make a gate is wrought iron. This metal is sought after because of its high durability and artistic quality. In the right hands, or with the right design, a wrought iron gate can be as elegant, classical and baroque as the homeowner may want. With this kind of material though, as with many metals, comes the issue of failing welds. When hinges become loose, the whole alignment of the gate door will suffer. 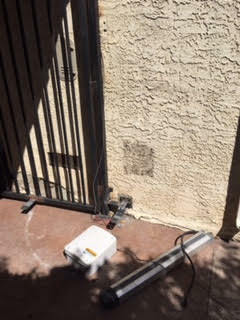 To fix this problem, we offer our gate repair services such as hinge welding and repair. For hinges that have already come apart, we can also perform hinge replacements. The next popular material for use in gates is wood. Wood is much softer than metal and is more vulnerable to the ravages of nature, especially when they were not prepared properly. When wood is exposed to certain fungal spores or termites, they will eventually disintegrate. Sometimes, this is hastened in the presence of high humidity but there is also a form of dry rot which doesn't require much moisture at all. To remedy rot, we offer our rotten gate repair services. We'll replace the rotten posts or gate doors to reinforce your gate and make it stronger. No matter the type of material you have for your gate, it is always best to have an opener installed. With the opener, you will enjoy the convenience of not having to get out of your car just so you can drive off to work or park in your driveway. These openers do get worn out however, that's why you will need to get periodic maintenance checks. If your gate opener stops working, it may have mechanical or electronic parts that need to be replaced. You can call us up at Garage Door Repair Vancouver for a professional gate repair service, and we'll have your gate, opener or intercom system up and running in no time!